Beer crepes benefit from a batter that rises better and has a lighter structure. The resulting crepes have the signature mini air pockets coveted by crepe aficionados alike. The right brew will not only help leaven the batter but will also impart desirable subtle flavors which can be paired with the filling/toppings. Minimally sweetened ricotta cheese with fresh blueberries and lemon zest is a dreamy, light filling. It can be a dessert in its own right, served in a small dish or a vibrant addition to breakfast oatmeal or granola. It is particularly good wrapped in the mantle of a fluffy crepe and dusted with confectioners sugar or drizzled with wild honey or agave. The texture and flavor of the crepes can be ‘managed’ to perfectly pair with the flavors of the ricotta based filling. Hefeweizen (wheat beer) is an outstanding choice in accomplishing that. Making beer crepes is one of the easiest ways to start using craft beer as ingredient in cooking. Browse more of our recipes here. There are several reasons for wheat beer to be especially suitable in this recipe. It is a highly carbonated brew which helps create the airy beer crepe batter that produces crepes dotted with numerous small air bubbles. It is minimally hopped and the bitterness (IBU 15 is common for the style) is virtually undetectable. At least fifty percent of the grain bill is malted wheat which brings about yeasty, bready notes and a touch of tartness. My base beer crepes recipe calls for 12 ounces of beer, so the flavor of the beer matters a lot more than in other crepe batters with beer you may come across. As a refresher, Hefeweizens are hazy due to the residual yeast and wheat proteins in the ale. When filtered, they are known as Kristallweizen. Hefeweizens are Bavarian wheat beers, distinguished by the unique yeast strain used to ferment them. In German ‘Hefe’ means ‘yeast’ and ‘Weizen’ means ‘wheat’. The specialized strain of yeast is responsible for the creation of the very distinct Bavarian Hefeweizen aroma profile – notes of clove, banana and bubble gum. When a different strain of yeast is used to ferment a brew with an identical grain bill and hops profile the signature aromas do not occur in an as pronounced manner or not at all. 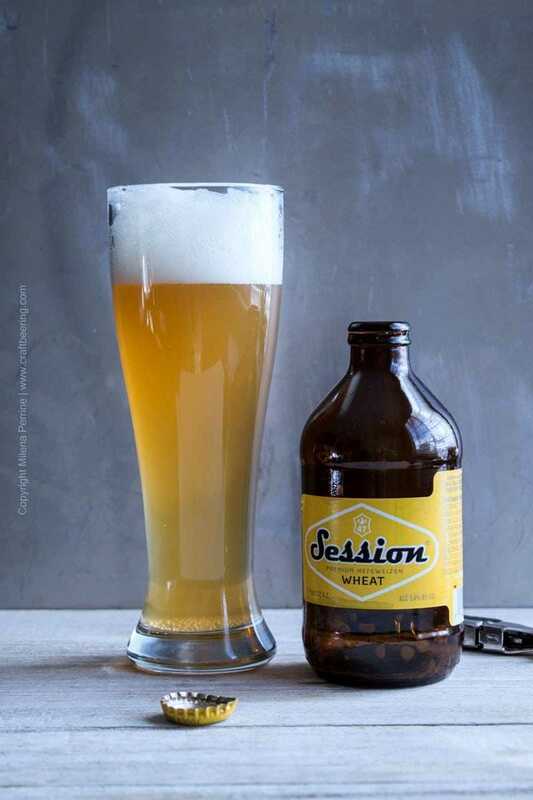 For example American style wheat beers have many of the landmark Hefeweizen qualities, but the American yeast strains creating them bring about different aromas. I would use a traditional Bavarian Hefeweizen with gusto in this recipe, especially if I was going for a banana, honey and walnuts filling. Or a Dunkelweizen like the one Chris made if using chocolate spread as filling. Because of the choice of ricotta, blueberries and lemon filling, I decided on a clean American ale yeast fermented brew. I used Full Sail Session Wheat from Hood River, Oregon. It is an American style wheat beer so there are no pronounced clove, banana and bubble gum esters. Instead, there is balanced citrus. Chris and I have been fans of the Full Sail’s session beers for many years and are always excited when new styles are added. The Session Wheat was included in their Session line up in 2016. It has a bready/yeasty, lemony and slightly spicy aroma with grainy, fruity and elegantly spicy aftertaste. Crisp and clean with a gorgeous citrusy hop finish it is an amazingly refreshing thirst quencher on hot summer days. And of course, it did its job in the subject crepe batter beautifully. Just the beer to be paired with ricotta, blueberries and lemon. Using a dedicated crepes pan is helpful, but not necessary. I actually like using smaller regular nonstick pans, with diameter between 6 and 8 inches. Smaller sized crepes are easier to flip and are better suited for the flute style fold I favor (rooted in a childhood obsession I still obey). The first beer crepe from each batch usually requires a bit more grease in the pan, but after that only a small amount (to the tune of 1/2 tsp) of melted butter or cooking oil is all that you need. Too much grease will result in the air pockets not forming. 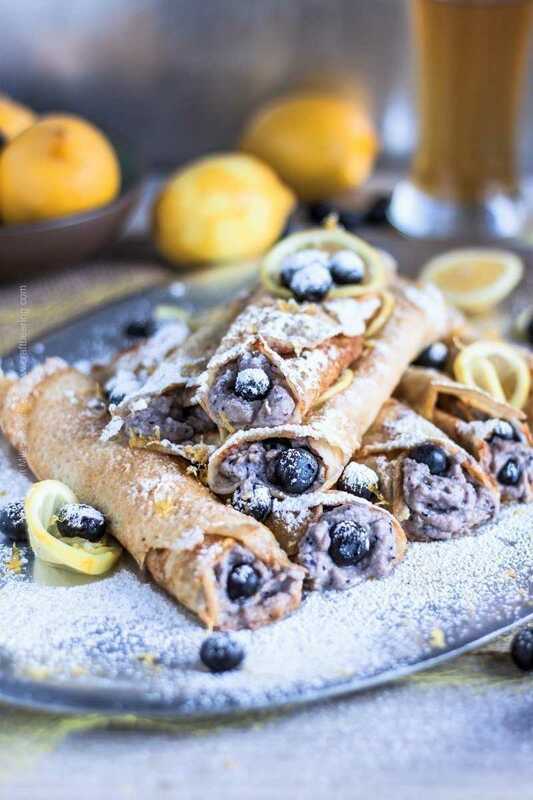 These beer crepes are very light with hints of citrus courtesy of the American style wheat beer used in the batter. 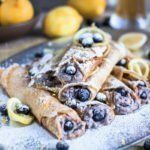 Their delicate flavor beautifully complements the fluffy filling of ricotta blended with fresh blueberries and lemon zest. In a large mixing bowl beat the eggs and add 3 tbsp of melted butter. Incorporate well. Add the warm milk and the Hefeweizen, gently whisk together and begin adding the flour, 1/4 cup at a time while gently whisking. Add a pinch of salt and continue whisking until the resulting batter becomes smooth and silky, with the consistency of heavy cream. If you have the time, let the batter rest refrigerated for about an hour. If not, proceed with making the crepes. Heat a non-stick pan over medium high heat. (Recommend using a smaller pan 6 to 8 inches in diameter). Melt the rest of the butter (5 tbsp) and use about 1 1/2 to 2 tsp to make the first crepe, then between 1/2 tsp and 1 tsp for each consecutive one (depending on your pan size). Add melted butter to the heated non-stick pan, swirl it around to grease the whole surface and pour enough batter to cover just over 1/3 of the center area of the pan, then promptly swirl the batter around to completely cover the pan's bottom. Add a little more batter if needed. Cook for about 2-3 minutes, until the edges begin to brown and you can slide the crepe around the pan. Flip the crepe onto the other side and cook for another minute. Slide the cooked crepe onto a platter and proceed with the next one. (Optional: insert parchment paper in between crepes). Keep the stack of cooked crepes near the stove to keep them warm. For the filling, blend the ricotta cheese with the blueberries and the confectioners sugar. Carefully fold in half of the lemon zest. 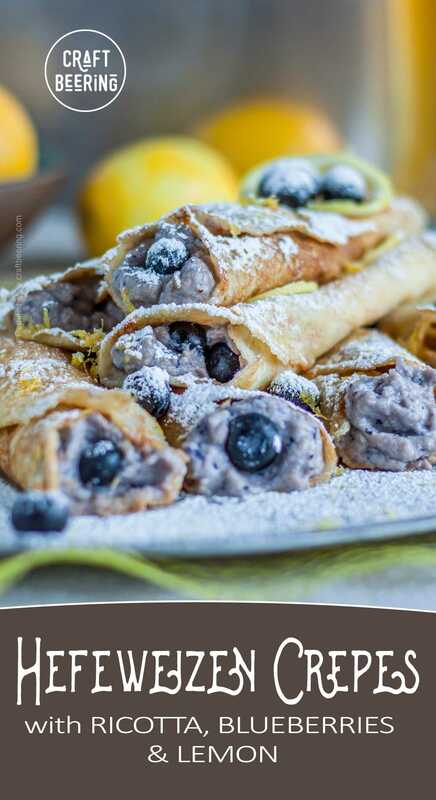 Using a spoon spread filling over one side of each crepe, add a few fresh blueberries and roll in the shape of a flute. 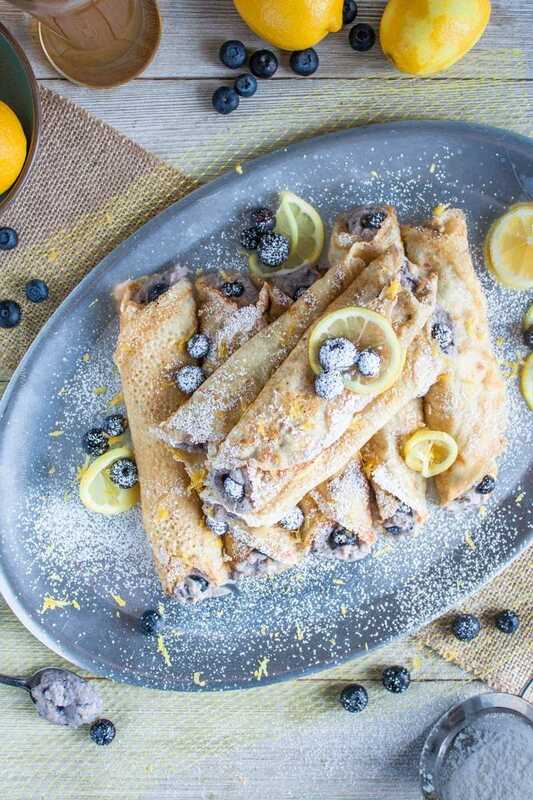 Arrange filled crepes on a platter, dust with confectioners sugar and sprinkle the remaining lemon zest. Garnish with lemon slices for visual effect. For best results, serve immediately. Want to make pancakes with beer instead? Use this recipe and select a Hefeweizen instead of porter to transfer the flavor profile of this beer crepes batter recipe. Use the ricotta, blueberries and lemon zest filling as a topping. And while we are at…how about a Beermosa? Brunch plans are getting better and better. Dessert after the chicken – maybe with a saison? Thank you for sharing at the What’s for Dinner Party – Can’t wait to see what you’ll bring this week! These crepes look fantastic! I’ve never seen recipes suggested to use beer in the batter, but I don’t see any reason why not. I’m intrigued, and I’ll give it a try. 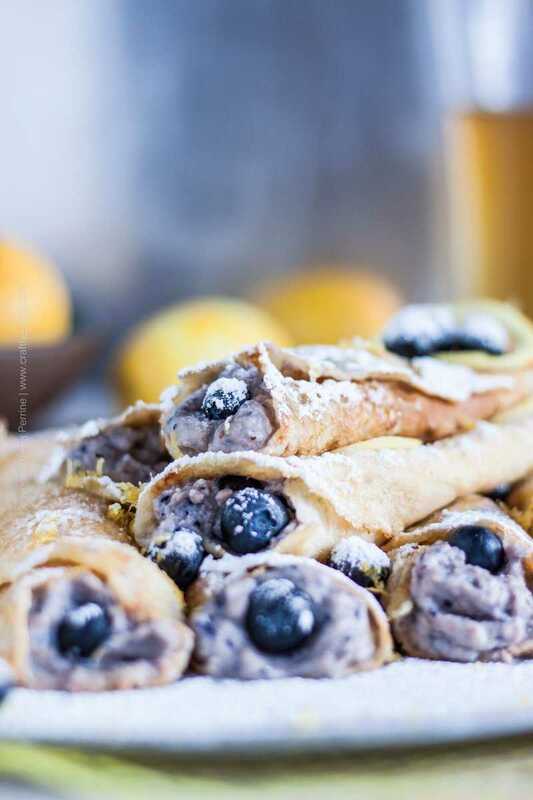 Love this ricotta berry filling – perfect addition to crepes. Thanks, Ben! Beer performs wonders in crepe batters:) Just need to select an appropriate style and you are off to greatness. These crepes look amazing and I just know they are going to be delicious too! Thank you for linking up your recipe at Create, Bake, Grow & Gather this week. I’m delighted to be featuring your beer crepes at the party at Shabby Art Boutique tomorrow night. Thanks for always inspiring us with such fun and creative beer recipes! We love people who reference beer as one of their favorite things:) Cheers, Amanda! Mind. Blown. I would have never thought of using beer for something like this…those look AMAZING! So interesting! I didn’t know beer worked as it did in these crepes…love it! And that Bavarian Hefeweizen sounds sooooo yummy. I need to whip up a batch of these and enjoy it with a bottle of that beer! Yum!! Hope you do, Kelly! Very tasty. 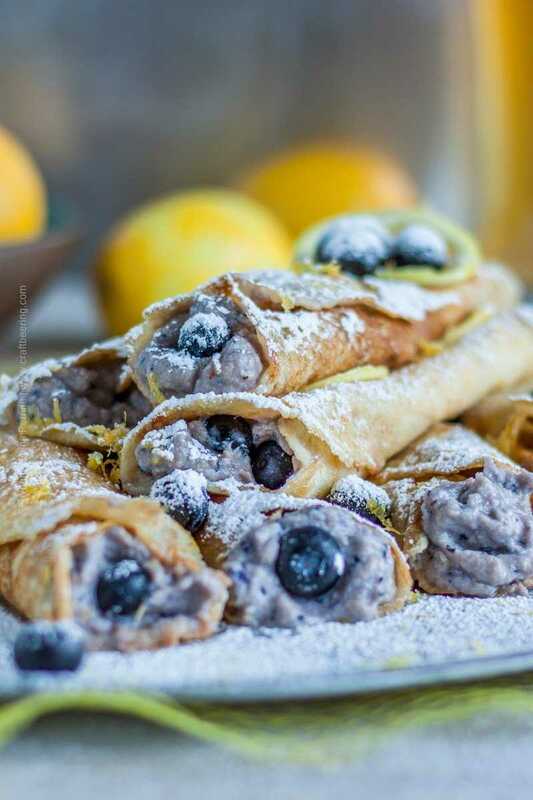 Hello, Blueberry ricotta crepes. I don’t eat enough crepes. I love them but I just never crave them. But if your Hefeweizen crepes were available I would eat them daily 🙂 There’s something about ricotta cheese that always makes me smile and I try to eat blueberries every day. This hefeweizen sounds like it would pair perfectly. Great recipe Milena. Thanks for sharing. This is totally off topic but I finally tried your fried jalapeno recipe and it was delicious 🙂 I used my airfryer to cut down on the fat, they came out perfect. I have an irrational love of crepes because they remind me of Swedish hotcakes, which I grew up eating whenever my grandma visited. We usually ate them with lingonberry jam, which isn’t my favorite, so filling them with ricotta and berries and lemon sounds like a dream. I’m thinking I need to make these for Easter breakfast! OMG, I know what you mean, Kelsie! My friend’s mom is Swedish and I have had the hotcakes you are talking about at her house in Scottsdale. Reallly good. Try these crepes out, you could also use a raspberry flavored saison or wheat beer and do a berry mix for the filling. Have a great week! I’ve never made crepes before but sure enjoy eating them! That filling looks so lush and you really can’t beat blueberries + lemon! How perfect would this be for weekend brunchin’?! Pinned! Happy Monday!! These are speaking to me!! Nothing like a sweet crepe to start… and end the day with! Beautiful! Haha. They speak to me, too:) My coffee was especially flattered to join in the fun!